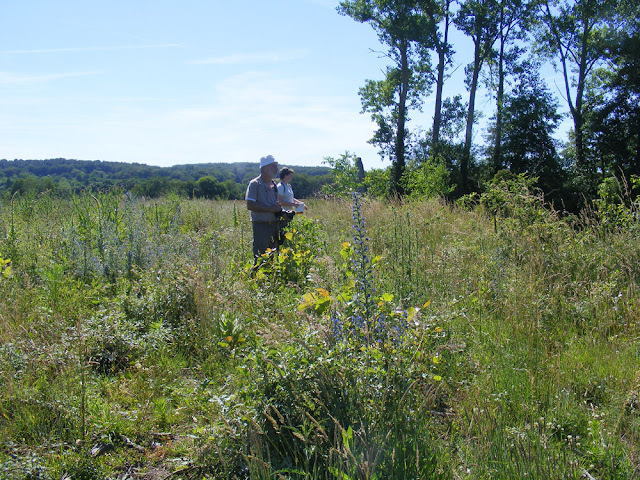 Recently I've been working with a small team to do a biodiversity survey of a site near Yzeures sur Creuse, known as the Pierre Levée. The site is made up of two former sand extraction pits that are now filled with water. A track runs between them and they are surrounded by cultivated farmland. The owner lives part time at the site. Between the two bodies of water, alongside the track, sits a prehistoric tomb -- the aforementioned Pierre Levée. The team consists of François, a biologist working for the Regional Nature Conservancy; Alain, the president of the Living History of the Claise Valley in the Touraine Association (PVCT); Maeva, an ecology student on a work placement; Jean-Claude, a retired ecologist; and me. 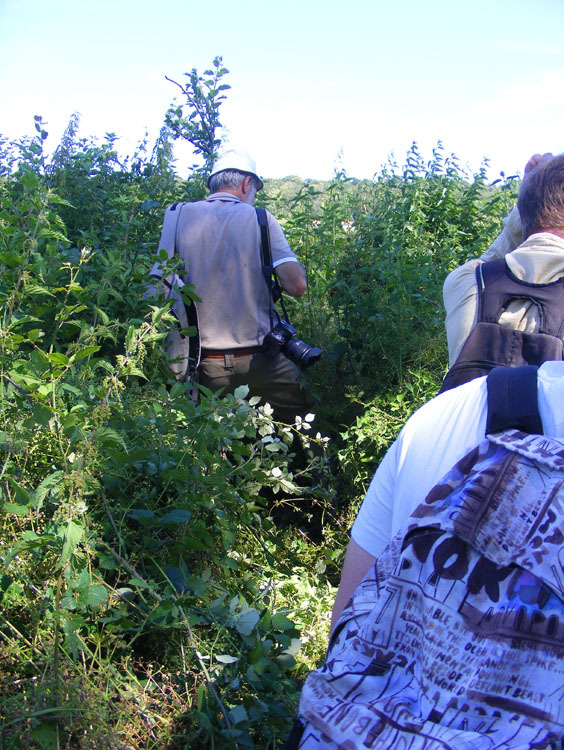 Here are some pictures from our activities on the site in late June. Leaf Blotch Miner Moth cocoon. 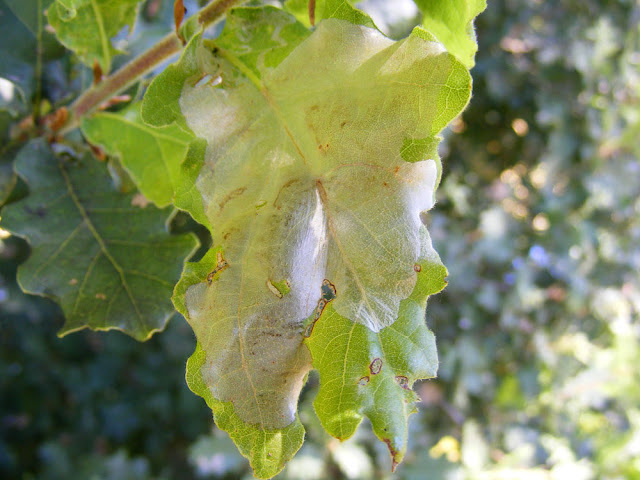 The caterpillars of the Leaf Blotch Miner Moth Acrocercops brongniardella feed on oak, in this case Downy Oak Quercus pubescens, making these characteristic white tissue paper like blotches on the leaves. The adult moths are one of those annoying micros that I try not to have anything to do with. They are a localised species, preferring open woodland, and are known to occur in Indre et Loire. Along parts of the banks of the ponds are Black Alder Alnus glutinosa. Some of them were infested with Alder Leaf Beetle Agelastica alni larvae. It occurs commonly all over France as far as I can tell, but curiously has not been officially recorded for Indre et Loire (or at least, any records haven't made it to the official National Natural History Museum public database). The French name for the beetle is la Galéruque de l'Aulne. Like many leaf beetles the adult is rounded, shiny and black. 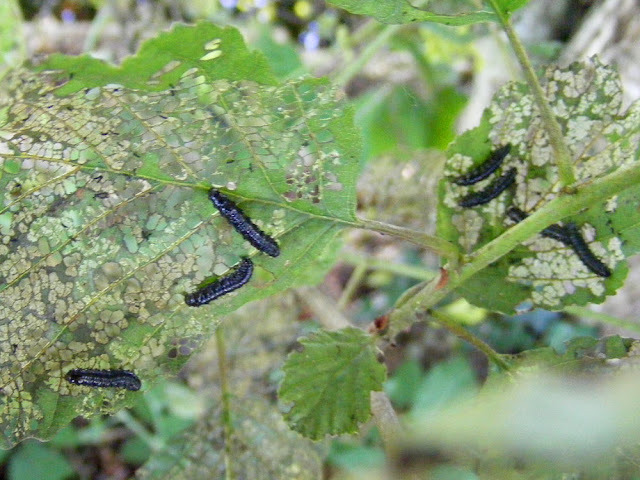 It can sometimes cause serious damage to its Alder tree host. Alain and Maeva making observations along the southern edge of the site. 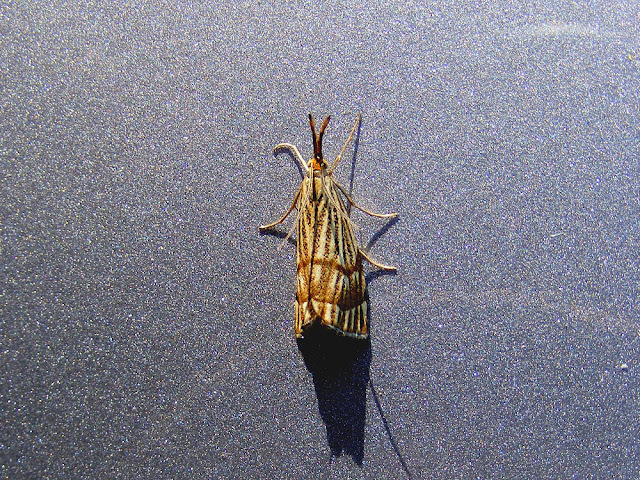 This grass moth Chrysocrambus linetella was recorded at the end of the visit, resting on Alain's car. Their caterpillars eat the roots of grasses. Thanks to Tim Ford for the identification. The French name for this little moth is le Crambus mordoré. 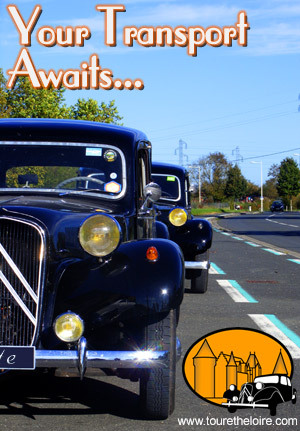 It occurs over much of France. 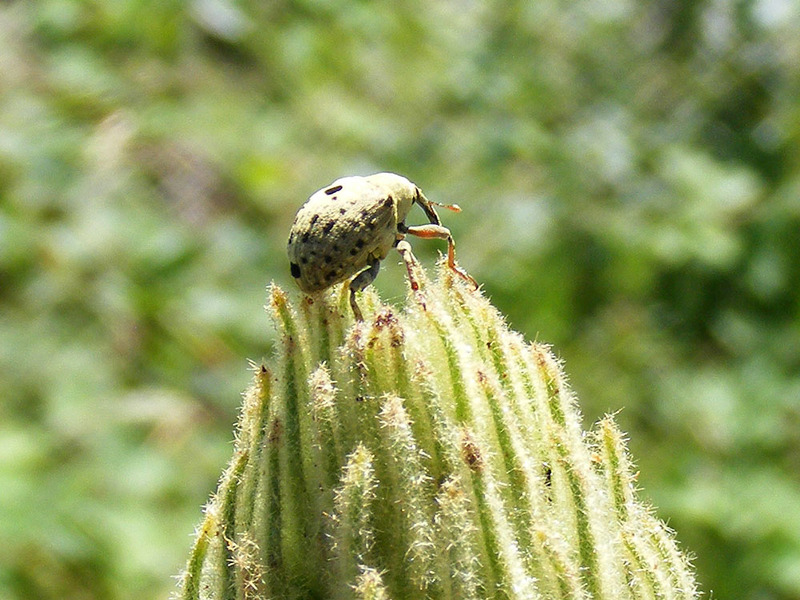 The charming little weevil Cionus hortulanus is widespread and abundant. There are about 40 species of Cionus in France, most of which look very, very similar. I'm no weevil specialist, so imagine my relief when this one turned out to quite easy to identify to species, based on its preference for Great Mullein Verbascum thapsus and the even colouration of the grey scales covering its body. The closest lookalike species favour Figwort Scrophularia sp and have scales that are different colours on different areas of the body. The French name is le Charançon gris de la scrophulaire. The robber fly Dasypogon diadema can be encountered on any sandy site in the area. 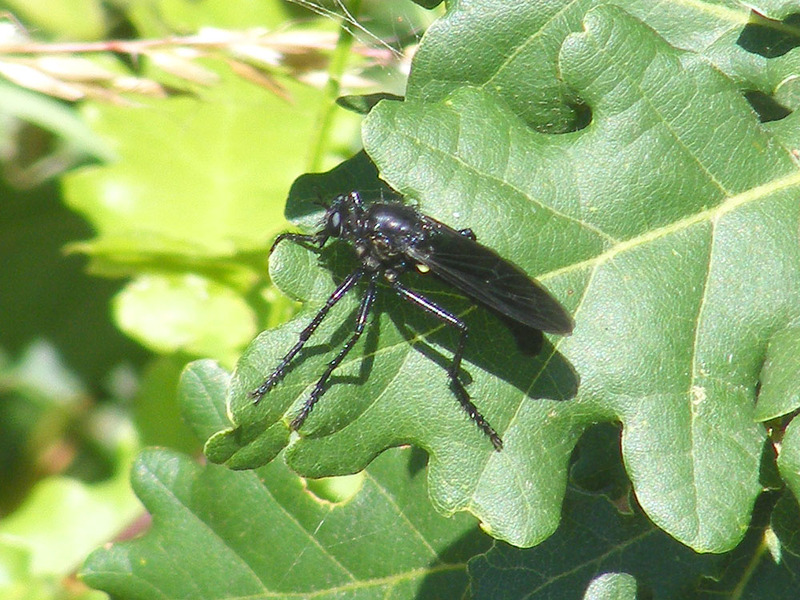 Males, like this one, are entirely black (except for their yellow halteres). I've created a species account on Loire Valley Nature for this species. 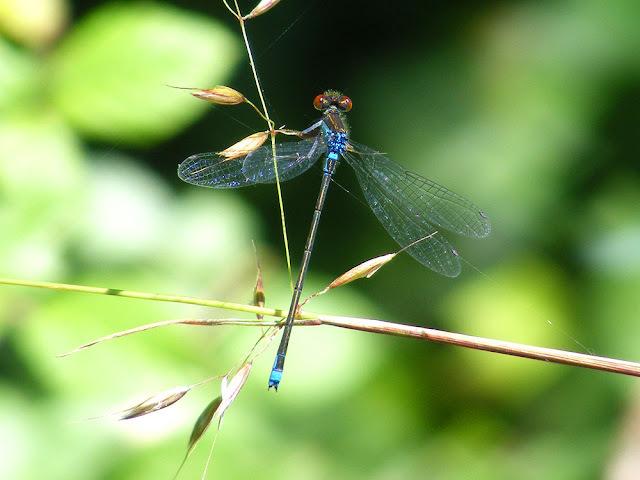 The Small Red-eyed Damselfly Erythromma viridulum (Fr. la Naïade au corps vert) prefers still ponds with some floating aquatic vegetation, and is widespread and abundant over much of France. 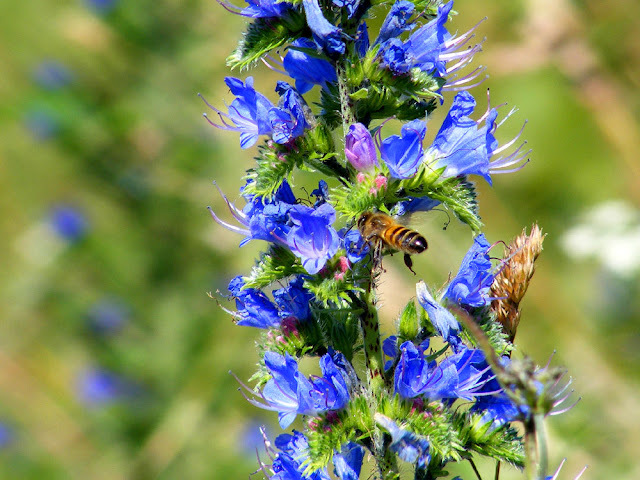 A Honey Bee Apis mellifera takes aim at a Vipers Bugloss Echium vulgare flower. 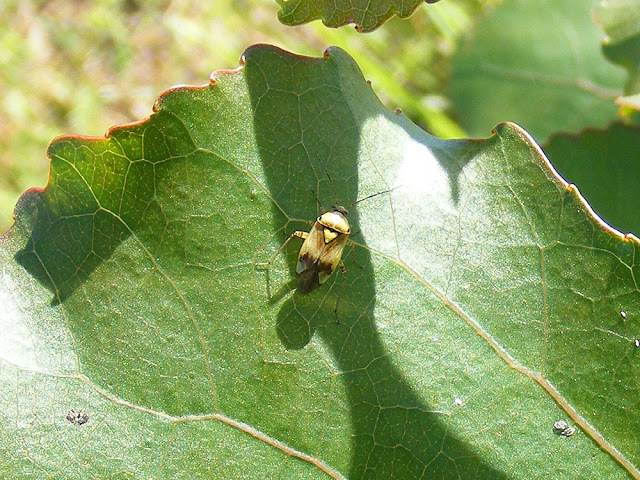 The mirid bug Lygus gemellatus is widespread and can be a pest of cereal and legume crops. The species is very variable in appearance, with a lot of differences in the amount and position of dark markings. Thanks to the Facebook group Insects and Other Invertebrates of Britain and Northern Europe I was able to identify this species. 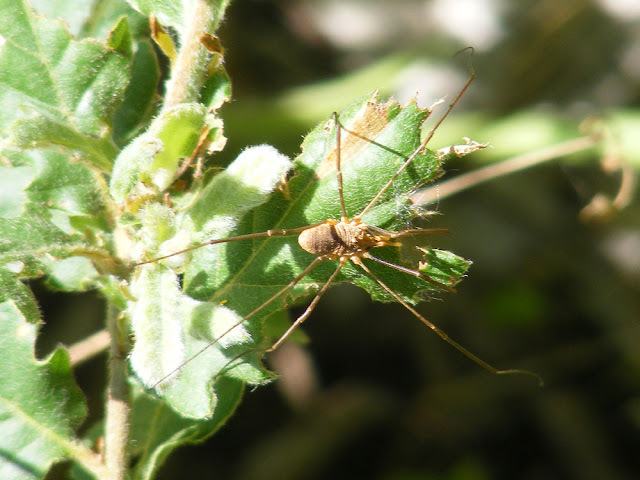 Harvestmen Opiliones are known as les Faucheurs in France. They are not spiders, having no venom and no silk. They are opportunist feeders, omnivores and detritivores. I think this one is Opilio parietinus. Alain selflessly beating a path for us through nettles and brambles.